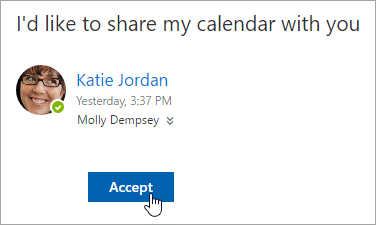 When you share your Outlook.com calendar with people, they're able to add it directly to their calendar view in Outlook. Depending on the permission you give them, they can view your calendar or edit it. You can also share your Outlook.com calendar with others by publishing your calendar and sending them a link to a webpage or a file. If your Outlook.com calendar won't sync in Outlook on Windows or you can't edit a shared Outlook.com calendar in Outlook on Windows, see My Outlook.com calendar won't sync or I can't edit a shared Outlook.com calendar. Note: Sign in to Outlook.com using any Microsoft account, including email accounts ending in @outlook.com, @live.com, @hotmail.com or @msn.com. If you have an Office 365 work or student account, see Share your calendar in Outlook on the web for business. At the bottom of the page, select to go to Calendar. At the top of the page, select Share, and choose the calendar you want to share. Note: You can't share calendars owned by other people. Enter the name or email address of the person with whom you want to share your calendar. Can view all details lets the person see all the details of your events. Can edit lets the person edit your calendar. Select Share. If you decide not to share your calendar right now, select . When sharing your calendar with non-Outlook.com users, such as Gmail users, they will only be able to accept the invitation using an Outlook.com or an Office 365 account. Calendar items marked private are protected. Most people with whom you share your calendar see only the time of items marked private, not the title, location, or other details. Recurring series marked as private will also show the recurrence pattern. 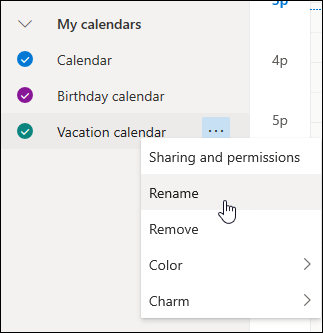 You can change the permissions you’ve set for a calendar, or stop sharing the calendar completely, by right-clicking the calendar name under Calendars. 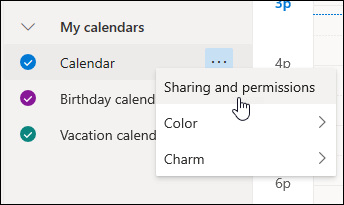 Under Calendars, right-click the calendar for which you want to update sharing settings, and select Sharing and permissions. Find the person whose permissions you want to change and either choose a new level of permissions or select to stop sharing your calendar with that person. If you receive an invitation to share someone else’s calendar, select Accept at the bottom of the message to add their calendar to your calendar view. After you add another calendar, you can rename it, change its color, or remove it from your view. To do this, right-click the calendar in the left pane. If you would like to stop sharing your calendar with someone, you can remove his or her permissions. In the left pane, right-click the calendar you want to stop sharing and select Sharing and permissions. By default, your primary calendar is called "My calendar". If you created other calendars, you can select one of them instead. You cannot remove sharing permissions from calendars owned by other people. Choose the person with whom you want to stop sharing your calendar and select . The person is now removed from the list of people with access to your calendar. His or her copy of your calendar will no longer sync to your calendar or receive updates. In Calendar settings, you can publish your calendar so anyone can view your calendar or subscribe to it. In Calendar view, select Settings > View all Outlook settings. Under Publish a calendar, choose which calendar you want to publish and how much detail people can see. If you choose an HTML link, recipients can copy and paste the URL in a browser to view your calendar in a new browser window. If you choose an ICS link, recipients can download the ICS file and import it into Outlook. This will add your events into their calendar, but recipients won't automatically receive any updates to your calendar. Alternatively, recipients can use the ICS link to subscribe to your calendar through Outlook. They'll see your calendar alongside their own and will automatically receive any updates to your calendar. HTML and ICS calendars are read-only, so recipients won't be able to edit your calendar. How often your ICS calendar syncs depends on the recipient's email provider. Under Publish a calendar, select Unpublish.